John Meyer was born on April 3, 1919, in Brooklyn, New York. He enlisted in the Aviation Cadet Program in November 1939 and was commissioned in the U.S. Army Air Corps and awarded his pilot wings on July 27, 1940. His first assignment was as an instructor pilot at Randolph Field, Texas, and Gunter Field, Alabama. He next served with the 33rd Pursuit Squadron of the 8th Pursuit Group stationed at Mitchel Field, New York, flying the P-40 Warhawk. While serving with this squadron, Meyer flew convoy patrol missions from Iceland. In September 1942 he was assigned to the 352nd Fighter Group where he was put in command of the 34th Pursuit Squadron, which was soon renamed the 487th Fighter Squadron. He led this squadron into combat in Europe flying P-47 Thunderbolts and later P-51 Mustangs. Col Meyer finished the war with 24 enemy aircraft destroyed in aerial combat, with another 13.5 destroyed on the ground in strafing runs on airfields. He flew 200 combat missions during WWII before an auto accident took him off flying status. Meyer served as the Secretary of the Air Force's contact with the U.S. House of Representatives from 1948 until he returned to flying status and took command of the 4th Fighter Group in August 1950. He led the Group into combat during the Korean War, where he was credited with destroying 2 MiG-15 fighters in aerial combat. After serving as Director of Operations with Air Defense Command, Meyer graduated from the Air War College at Maxwell AFB, Alabama, and then served as an instructor there. He next served with Strategic Air Command where he commanded two air divisions before he became deputy director of plans at Headquarters Strategic Air Command in July 1962. General Meyer was next assigned as commander of 12th Air Force in November 1963 and then was assigned to the Joint Chiefs of Staff in February 1966, where he served as deputy director and then vice director of the Joint Staff. He became director of operations on the Joint Staff in May 1967. 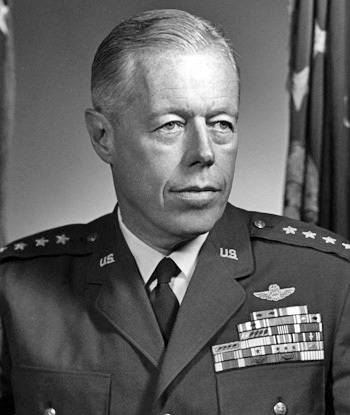 Gen Meyer served as Vice Chief of Staff of the Air Force from August 1969 until he became Commander in Chief of Strategic Air Command on May 1, 1972. He served in this position until he retired from the Air Force on July 1, 1974. General Meyer wears Command Pilot Wings and the Master Missile Badge, and was credited with destroying 26 aircraft in the air in two wars. He died on December 2, 1975. The President of the United States takes pleasure in presenting a Second Bronze Oak Leaf Cluster in lieu of a Third Award of the Distinguished Service Cross to John C. Meyer, Lieutenant Colonel (Air Corps), U.S. Army Air Forces, for extraordinary heroism in connection with military operations against an armed enemy while serving as Pilot of a P-51 Fighter Airplane and as Deputy Commander, 352d Fighter Group, EIGHTH Air Force, in aerial combat against enemy forces on 1 January 1945, during the Luftwaffe's desperate mass strike on airfields in Belgium and Northern France. The 352d Group, of which Lieutenant Colonel Meyer was then deputy commander, was operating temporarily from a field in Belgium under IX Tactical Air Command. As he was about to lead 12 P-51s off the runway, the field was attacked by an estimated 50 enemy fighters. Taking off with full wing tanks, Lieutenant Colonel Meyer shot down one FW-190 just after he had raised his landing gear. Then, in a 45-minute running battle, he downed another FW-190. Lieutenant Colonel Meyer's unquestionable valor in aerial combat is in keeping with the highest traditions of the military service and reflects great credit upon himself, the 8th Air Force, and the United States Army Air Forces.